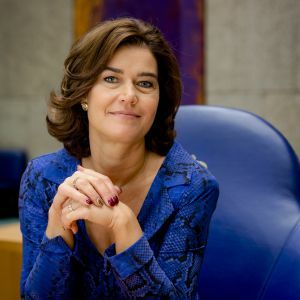 The chairwoman of the Dutch parliament resigned on Saturday amid an ongoing row over a multi-million euro deal agreed between a senior justice ministry official and a convicted drugs baron. Anouchka van Miltenburg had come under fire after it emerged an anonymous letter giving details about the deal was shredded by her officials. Both Van Miltenburg and the former minister at the centre of the deal – Fred Teeven – are members of the ruling VVD. Teeven resigned as junior justice minister over the issue in March. In a short statement, Van Miltenburg said she continued to believe she had acted properly but that she did not want to damage the office of parliamentary chairwoman with the ongoing discussion. She had been due to answer MPs questions about the shredded document next week. The letter, from someone who worked at the justice ministry, gave details about the 4.7 million guilder payment – equivalent to €2.13 million – agreed between Teeven and drugs baron Cees H in 2000. As part of the deal, Teeven agreed to return the money to H in return for a fine of 750,000 guilders (€340,335). In the letter, the tipster said justice minister Ivo Opstelten had wrongly informed parliament about the deal by saying there were no receipts or other evidence about it. Both Teeven and Opstelten resigned this March after an old receipt came to light confirming the amount of the payment. At the time, Van Miltenburg’s staff shredded the letter. When confronted about it later and given a copy by reporters, she said this was normal practice with anonymous letters and had that copy shredded as well. Van Miltenburg is also reported to have told staff the matter was a ‘storm in a teacup’.